History centre proposed for Marbella Lighthouse | Marbella Marbella – Adelante! 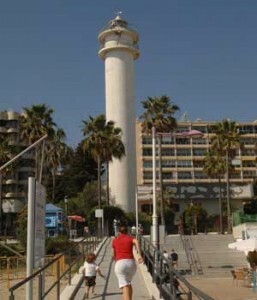 In a move to preserve the Marbella Lighthouse, the Socialist Party (PSOE) and the Andalucía Ministry of Tourism have proposed to the Port Authority the establishment in the building of an interpretive centre on the history of tourism in the Costa del Sol. The proposal also allows for a possible museum or exhibits on the history of maritime navigation, according to an official with the tourism ministry in Málaga. Susana Radío, provincial secretary for arts and culture, explained that the first step of the project will be to make a motion to the full City Council of Marbella. The city government will need to show its explicit support for the proposal, she said. The Port Authority would then make a long-term contract with the Ministry of Tourism for the rehabilitation and maintenance of the lighthouse complex, which has three adjacent buildings with about 350 square metres and gardens of about 2,500 square metres. The proposal is facing some political hurdles, however. It is igniting charges between the PSOE and the local governing conservative PP. The city councillor in charge of the environment, Antonio Espada, has criticised the PSOE for ‘attempting to confuse’ the public with a proposal ‘which the City has been working on for two years’. He blamed the provincial Port Authority, rather than the city, for delays in planning for the lighthouse’s preservation. Espada recalled that the city government had already asked the Port Authority to take steps toward conserving the complex three times. First, in October 2008 and again in April 2009, the city council submitted a request, and in April 2010, the Local Government Board asked the Port Authority to ‘take the necessary actions for the rehabilitation and conservation’ of the property, ‘but nothing has been done yet’. The PSOE countered by saying, ‘While the local executive is unable to submit working projects for the city, the Socialists continue to take emblematic actions in the recovery of this lighthouse’.